Advanced Mac users may find it useful to know that DNS servers in OS X can be set from the command line, without having to turn to the System Preferences Network control panel. While the GUI Network control panel is undeniably the easiest approach for most Mac users, the command line method offers benefits for many use cases, particularly for troubleshooting, making temporary DNS changes, and remote management with ssh. 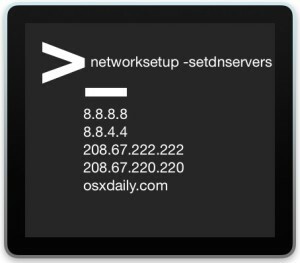 To change DNS settings from the command line of OS X, you’ll be using the ever-useful ‘networksetup’ command. While networksetup has many advanced and complex uses, setting DNS is actually quite easy. This is just an example of DNS servers and not necessarily a universal recommendation. If you’re looking to change yours, it’s worthwhile to find the fastest DNS server through apps like NameBench, which perform benchmark testing to determine which DNS will be fastest for your particular location. As with setting DNS, removing DNS may require you to flush DNS caches after making adjustments, depending on what you’re trying to do. Changing and customizing DNS can have a wide variety of purposes, from speeding up lookups, to finding more reliable servers, to changing to alternate providers to perform detailed lookups during propagation, amongst many other situations. They should really update that above. preferably with a small e “empty”, that’s what is referred in the manpage, although Empty works as well. There’s an S missing in “-setdnservers” in the above screenshot. What about if I want to change my ethernet – what do I put instead of Wi-Fi ? Open Network control panel and change DNS in system preferences, the command line is not for you if you are not prepared to detect the network interface. Ethernet and wi-fi on the same Mac often. Such a rude reply. Why bother replying at all? Chris, you can see the names of all the network services by typing `networksetup -listallnetworkservices`.